Showing results for tags 'japanese'. This is a collection of all possible Trades and Gifts of in-game NPC's credentials in every language possible. All Generation I-IV Trades are obtained at the lowest level possible with thorough research. Please refer to the .txt included in the collection archive for details on what to edit to make any of them to your personal liking. Credits: @Taargüs Taargüs - For providing the PK5s for all languages of B2W2 Yancy and Curtis trades, and also the Korean B2 Petilil! @RobustRabbit - For providing CHT SM and USUM trades! @ViolentDarkBrown - For providing all languages of trades in Let's Go, Pikachu/Eevee! Serebii and Bulbapedia - For providing the location whereabouts and details for the lowest levels possible of NPC's requested Pokemon. (Even though they contradict each other sometimes...) And of course, anyone who reports errors! If you would like to share this collection archive around other websites, you are free to do so, but please give credit to the mentioned users for their generosity to contributing. Thanks! PSA: If PKHeX flags any Pokemon as invalid, please do collate the files that do so and report them in the PKHeX forum. And if you think a Gen 1-4 Pokemon can't be at a certain level, please do notify me about it (and provide sources). Thanks! These are Pokemon FireRed savefiles which contain a compilation of legit event Pokemon for the Generation 3 games (Ruby, Sapphire, Emerald, FireRed & LeafGreen). These savefiles have been in development by several ProjectPokemon members since April 2016, but has been hosted exclusively on another website. As of now, these savefiles will be concurrently hosted on ProjectPokemon as well. The Genaration III Pokemon games had a ton of events, many of which are extremely hard to obtain today. The Gen III games predate any sort of internet trading, and the event Pokemon from this generation have often been migrated up to newer Pokemon games. These factors make it quite hard to find legitimate event Pokemon for Gen III. The only way we can expect to obtain more event Pokemon for Gen III is if others share their save/pk3 files, so please consider sharing if you happen to have some! To learn more about Pokemon events in Generation 3, you can look over the following pages: List of English event Pokémon distributions in Generation III List of Japanese event Pokémon distributions in Generation III List of Journey Across America event Pokémon distributions List of Party of the Decade event Pokémon distributions List of PCNY event Pokémon distributions in Generation III List of Gather More Pokémon! Campaign event Pokémon Pokémon Colosseum Bonus Disc ----- The main savefile contains the following event Pokemon in each box: Box 1 & 2: 10th Anniversary (Europe, Top 10 Distribution) + Aura Mew Here we have a full set of all European 10th Anniversary Pokemon, each of the ten Pokemon in English, French, German, Italian, and Spanish. The OT for each language is as follows: 10ANNIV (ENG), 10JAHRE (GER), 10ANNIV (FRE), 10ANNI (ITA), 10ANIV (SPA) These Pokemon were selected through a poll and later distributed at various locations in 2006 for the "Top 10" event throughout Europe to celebrate 10 years of Pokemon. We also have a full set of Aura Mew distributions from Europe, each in English, French, German, Italian, and Spanish. OT is the same for each language. Aura Mew was distributed at various locations in August 2007 throughout Europe. Note: The English 10ANNIV distribution rom and English Aura Mew distribution rom have been released to the public. Unlike the English 10ANNIV, the English Aura Mew will distribute all five languages of Aura Mew. Due to legality reasons, the roms can not be shared here, but a simple Google search should help. Box 1: 10th Anniversary (Europe), Part I Charizard (x5, one of each language) Pikachu (x5, one of each language) Articuno (x5, one of each language) Raikou (x5, one of each language) Entei (x5, one of each language) Suicune (x5, one of each language) ----- Box 2: 10th Anniversary (Europe), Part II + Aura Mew Lugia (x5, one of each language) Ho-Oh (x5, one of each language) Latias (x5, one of each language) Latios (x5, one of each language) Aura Mew (x5, one of each language) ----- Box 3 & 4: 10th Anniversary (United States, JAA + PotD Top 20 Distributions) Here we have both full sets of United States 10th Anniversary Pokemon. One set was distributed at the "Journey Across America" event, and one at the "Party of the Decade" event. Both sets are nearly identical, though have different Trainer IDs. JAA has the TID 00010, and PotD has the TID 06808. JAA has an extra distribution that makes this set unique, that being Celebi. PotD has a unique Pikachu that differs from the JAA counterpart, due to knowing the move Fly. Box 3: 10th Anniversary (United States), Journey Across America (10 ANIV, Trainer ID: 00010) Bulbasaur Charizard Blastoise Pikachu Alakazam Articuno Zapdos Moltres Dragonite Typhlosion Espeon Umbreon Raikou Entei Suicune Tyranitar Blaziken Absol Latias Latios Celebi (x10) ----- Box 4: 10th Anniversary (United States), Party of the Decade (10 ANIV, Trainer ID: 06808) Bulbasaur (x2, one evolved to Venusaur) Charizard Blastoise (x2, one with gained experience) Flying Pikachu Alakazam Articuno Zapdos Moltres Dragonite (x2) Typhlosion Espeon Umbreon Raikou Entei Suicune Tyranitar Blaziken Absol Latias Latios ----- Box 5: Pokemon Center New York (PCNY) Distributions These Pokemon were distributed at Gotta Catch 'Em All! Stations in the New York Pokemon Center between 2003 and its closing in January 2005. These PCNY sets are incomplete, however we have a good portion of them. Some of the Pokemon distributed here also were poorly documented, so we have some PCNY events that aren't listed on Bulbapedia. Due to this, there may be other PCNY events that we don't yet know about. Dragon Week Seadra Dragon Week Flygon Dragon Week Altaria Dragon Week Flygon Monster Week 2, Lv50 Exploud Monster Week 2, Lv100 Exploud Monster Week 2, Lv50 Aggron Monster Week 2, Lv100 Aggron Monster Week 2, Lv50 Wailord Monster Week 2, Lv100 Wailord Monster Week 2, Lv50 Crawdaunt Monster Week 2, Lv100 Crawdaunt Christmas Day Zangoose Christmas Day Seviper Christmas Day Milotic Pokemon Box Promo Flygon Pokemon Box Promo Seviper Pokemon Box Promo Spite Absol Pokemon Box Promo Wish Absol Undocumented PCNY Machamp Undocumented PCNY Tropius Undocumented PCNY Gardevoir PCNY Wish Chansey Egg PCNY Wish Drowzee Egg PCNY Wish Exeggcute Egg PCNY Wish Farfetch'd Egg PCNY Wish Kangaskhan Egg PCNY Wish Lickitung Egg ----- Box 6: English Events This box contains the remaining English events not yet mentioned. Several JEREMY are still missing. Note: Several savefiles from FireRed carts that were officially used to distribute Mystery Mew by direct trade have been released to the public, which as a whole contain all 420 possible selections of the boxed Mews. If you wish to make your own selection from the 420 Mews, please see this page: MYSTRY Mew FireRed Distribution Cart Savefiles. The GBA cartridge version of the English Berry Glitch Fix Shiny Zigzagoon distribution used in the UK has also been released to the public. Due to legality reasons, this rom can not be shared here, but a simple Google search should help. Berry Glitch Fix Shiny Zigzagoon (x2, OTs RUBY and SAPHIRE) JEREMY Vulpix JEREMY Haunter (evolved to Gengar due to direct trade distribution) JEREMY Tauros ROCKS Metang (evolved to Metagross, we still need an untouched version) SPACE C Deoxys DOEL Deoxys MYSTRY Mew WISHMKR Jirachi (x2, Salac and Ganlon Berries) CHANNEL Jirachi (x2, Salac and Ganlon Berries) METEOR Jirachi (UNRELEASED, beta distribution multiboot file found hidden alongside WISHMKR's multiboot file in US Bonus Disc) Shiny WISHMKR Jirachi (x9, every possible shiny Jirachi from US Colosseum Bonus Disc) Shiny CHANNEL Jirachi ----- Box 7: Japanese Events, Part I This box contains most Japanese events, excluding Egg distributions and GMPC(GCEA) events. A few are still missing, as noted by empty slots. Wishing Star (Negaiboshi) Jirachi (x2, Ganlon and Salac Berries) Berry Glitch Fix Shiny Zigzagoon (x2, OTs ルビー[Ruby] and サファイア[Sapphire]) 2004 Tanabata Jirachi (x2, Apicot and Petaya Berries) All Nippon Airways (ANA) Pikachu PokePark Meowth Yokohama Pikachu Hado Mew GW Pikachu 2005 Tanabata Jirachi (x2, Apicot and Petaya Berries) Festa Metang Sunday Wobbuffet Hado Regice Hado Registeel PokePark Mew PokePark Celebi 2006 Tanabata Jirachi (x2, Ganlon and Salac Berries) Mitsurin Celebi ----- Box 8: Japanese Events, Part II This box contains a complete set of all "Pokemon Center 5th Anniversary Eggs", a complete set of all "Egg Pokemon Present Eggs", and a complete set of all "PokePark Eggs". Wish Pichu Egg Teeter Dance Pichu Egg Shiny Wish Pichu Egg Shiny Teeter Dance Pichu Egg Wish Ralts Egg Charm Ralts Egg Wish Absol Egg Spite Absol Egg Wish Bagon Egg Iron Defense Bagon Egg Leech Seed Oddish Egg Petal Dance Meowth Egg Sweet Kiss Poliwag Egg Teeter Dance Bellsprout Egg Mud Sport Psyduck Egg Follow Me Pichu Egg Tickle Igglybuff Egg Mud Sport Corsola Egg FeatherDance Taillow Egg Mud Sport Surskit Egg Teeter Dance Whismur Egg Rollout Skitty Egg Water Sport Plusle Egg Mud Sport Minun Egg Uproar Spoink Egg Sing Spinda Egg Encore Cacnea Egg Water Sport Corphish Egg Tickle Wynaut Egg ----- Box 9: Japanese Events, Part III This box contains the first four campaign sets of the "Gather More Pokemon! Campaign" (aka "Gotta Catch Em All") distributions. First Campaign: Treecko Torchic Mudkip Second Campaign: Chikorita Cyndaquil Totodile Third Campaign: Ekans Pikachu Meowth Growlithe Bellsprout Slowpoke Shellder Chansey Kangaskhan Scyther Electabuzz Magmar Tauros Murkrow Misdreavus Qwilfish Sneasel Delibird Mantine Fourth Campaign: Bulbasaur Charmander Squirtle ----- Box 10: Japanese Events, Part IV This box contains the last two campaign sets of the GMPC (GCEA) distributions. Fifth Campaign: Pikachu Lotad Seedot Surskit Skitty Sableye Mawile Meditite Plusle Minun Roselia Zangoose Seviper Lunatone Solrock Chimecho Sixth Campaign: Pikachu Hoothoot Mareep Aipom Sunkern Wobbuffet Pineco Gligar Snubbull Shuckle Teddiursa Houndour Stantler Smeargle ----- Box 11: Special Pokemon from "Colosseum" and "XD: Gale of Darkness" for Nintendo GameCube This box contains all special pokemon from Colosseum and XD, such as the MATTLE Ho-oh which is very tedious to obtain. This also includes the unreleased English variants of the Japanese Bonus Disc's Celebi and Pikachu, and the Japanese e-Card exclusive Togepi, Mareep and Scizor. Lastly included is the Johto starters from XD, as they are also incredibly tedious to obtain. JP Ageto Celebi JP Colosseum Pikachu JP Mt. Battle Ho-oh JP e-Reader Togepi JP e-Reader Mareep JP e-Reader Scizor EN AGATE Celebi (UNRELEASED) EN COLOS Pikachu (UNRELEASED) EN MATTLE Ho-oh (x3) EN e-Reader Togepi (UNRELEASED, x3) EN e-Reader Mareep (UNRELEASED, x3) EN e-Reader Scizor (UNRELEASED, x3) XD Chikorita (x2, English and Spanish) XD Cyndaquil (x2, English and Spanish) XD Totodile (x2, English and Spanish) ----- Box 12: Special Egg Gifts from "Pokemon Box: Ruby & Sapphire" for Nintendo GameCube After a certain amount of Pokemon are deposited into Pokemon Box from one of you GBA games, you are gifted an egg that contains a Pokemon with a special move. False Swipe Swablu Egg (x5 + one hatched) (after first deposit) ExtremeSpeed Zigzagoon Egg (x5 + one hatched) (after 100 deposited) Pay Day Skitty Egg (x5 + one hatched) (after 500 deposited) Surf Pichu Egg (x2 + two hatched) (after 1499 deposited) ----- Box 13: In-Game Special Pokemon This box contains rare in-game Pokemon such as standard legendary Pokemon, and event-exclusive island legendary and mythical Pokemon. Several of these are also included as Shiny. Note: The American Aurora Ticket distribution rom has also leaked to the public. The American version of this rom only supports FRLG, not Emerald like the European version (not public). Due to legality reasons, this rom can not be shared here, but a simple Google search should help. FRLG Articuno FRLG Zapdos FRLG Moltres FRLG Mewtwo Southern Island Latias Southern Island Latios RSE Regirock RSE Regice RSE Registeel RSE Kyogre RSE Groudon RSE Rayquaza Faraway Island Mew (UNRELEASED, English) Navel Rock Ho-oh Navel Rock Lugia Birth Island Deoxys Shiny Regice Shiny Rayquaza Shiny JP Faraway Island Mew Shiny Navel Rock Lugia Shiny Navel Rock Ho-oh Shiny Southern Island Latias Shiny Southern Island Latios Shiny Birth Island Deoxys ----- Box 14: Helpful Pokemon This box contains Pokemon that can be helpful in-game for the Battle Tower and for Pokemon Contests. Battle Tower: Salamence Suicune Snorlax Contests: Cool Swellow Cute Milotic Beauty Camerupt Tough Donphan Smart Banette ----- **POKEMON STILL NEEDED** Japanese: STAMP Absol STAMP Pichu Sapporo Pikachu Hadou Regirock (plus more Hadou Regice & Registeel for research) PokePark Jirachi English: ROCKS Metang (untouched) 9 of 12 JEREMY More of any PCNY events ----- The extra savefiles contain the following event Pokemon in each box: The extra savefiles provided contain overflow of the existing event pokemon from the main savefile. As the main savefile usually provided only one or two of each event, these overflow savefiles contain a larger selection of each event to choose from. However when it comes to Japanese events, there are far too many available to be necessary to include here. Most overflow of each Japanese event are included here, the only exception being the hundreds of event Pikachu. So if you want the full compilation of overflow Japanese events, please see this page: Ahiru's Wonderland Gen III Event Savefiles Event Savefile 2: Box 1 - 3: PCNY events (x83) Box 4: Journey Across America 10 ANIV events (x28) Box 5: 10 ANIV Celebi (x10) + Wishing Star (Negaiboshi) Jirachi (x11) + Doel Deoxys (x6) Box 6: German Aura Mew (x24) + Spanish Aura Mew (x1) + Shiny CHANNEL Jirachi (x5, one of each language) Box 7: Space C Deoxys (x30) Box 8: WISHMKR Jirachi (x18) + CHANNEL Jirachi (x10) Box 9: Ageto Celebi (x30) Box 10: Pokemon Box Eggs (x5 hatched, x9 eggs) Box 11: In-Game Island Captured Events (x14) Box 12: In-Game Unown full set (x28) Box 13: Debug distributions from the German Debug version of Pokemon Ruby (x30) Box 14: Debug Unown full distribution set from the German Debug version of Pokemon Ruby (x28) Event Savefile 3: Box 1 - 3: Ageto Celebi (x77) Box 4: Pokemon Center 5th Anniversary Eggs (x30) Box 5: JP Berry Glitch Fix Shiny Zigzagoon (x27) Box 6 - 7: Egg Pokemon Present Eggs (x48) Box 8 - 10: PokePark Eggs (x90) Box 11: Hadou Mew (x10) + 2005 Tanabata Jirachi (x2) + Festa Metang (x10) + Sunday Wobbuffet (x5) + PokePark Mew (x1) Box 12: PokePark Celebi (x6) + 2004 Tanabata Jirachi (x1) + PokePark Meowth (x1) + 2006 Tanabata Jirachi (x4) + ANA Pikachu (x18) Box 13: GW Pikachu (x15) + Yokohama Pikachu (x15) Box 14: Mitsurin Celebi (x30) Event Savefile 4: Box 1 - 5: GMPC (GCEA) (x139) Box 6 - 14: *empty boxes for potential future expansion* In-Game Trades Savefile: Box 1: Full set from Ruby & Sapphire - English, German, French, Italian, Spanish, and Japanese respectively Box 2: Full set from Emerald - English, German, French, Italian, Spanish, and Japanese respectively Box 3: Full English set (x2) from FRLG Box 4: Full German set from FRLG Box 5: Full French set from FRLG Box 6: Full Italian set from FRLG Box 7: Full Spanish set from FRLG Box 8: Full Japanese set from FRLG Box 9: Full English set from Colosseum and XD ----- Credits: Although @InsaneNutter started this project in 2016, and has put many hours into its development, it would have never grown this large without the massive contributions from the following people. If you contributed something that has made its way into these savefiles and you aren't credited below, please let us know! @vi3t - The original FireRed savefile this was built upon. @InsaneNutter - Started the compilation of events in this savefile, and continued developing it alongside HaxAras. @HaxAras - Continued help with developing this savefile, and has contributed many Pokemon from his personal collection. Big Mike - Contributed events to his friend HaxAras. @King Impoleon - Overflow Box of German Aura Mew, Overflow Box of Space Center Deoxys, and one Doel Deoxys. @Nigoli - 111 Ageto Celebi @Deoxyz - The English, French, German, Italian and Spanish Top 10 & Aura Mew in the main save, the 5 Doel Deoxys in the overflow save, as well as two of Mystery Mew distribution savefiles. Also the 10ANNIV, Aura Mew, BGF Shiny Zigzagoon, and Aurora Ticket distribution cartridges. Recently did the massive revamp of these savefiles to their current appearance and organization. 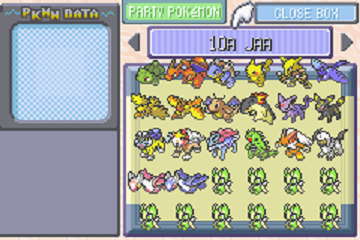 @Misdreavus - The full set of JAA 10 ANIV Pokemon with two 10 ANIV Celebi, all in the main save. @Invader TAK - Three 10 ANIV Celebi in the main save. SWAMP.N - JAA 10 ANIV Articuno Zapdos, Raikou, Entei, Suicune, Celebi, Latias, Latios, and a Space Center Deoxys all in the overflow save. @arjun - The evolved ROCKS Metagross, shiny Regice & shiny Rayquaza in the main save, and full set of Unown in the overflow save. Ahiru's Wonderland - A no longer existing website which actively archived tons of Japanese event pokemon from 2003 to 2006. @Sabresite - Legitimacy checking many of these event Pokemon with his currently unreleased tools. @Kaphotics - Developing PKHeX, the program which without would have made the massive revamp of these savefiles a complete nightmare. @Gridelin - The Shiny Channel Jirachi and providing a detailed guide on how it was obtained. Thanks to @Baegislash for helping me convert my German Colosseum save to NTSC, I was able to do the E-reader battles again and make save states. Here is a set of Japanese Colosseum E-reader shadow Pokemon save states. The OT name has been changed to PPorg and the TID/SID have been changed to all 0's. So you'll have to import your own data and Pokeballs if you want something outside of the standard Pokeball. You will also need to import your own Pokemon as I cleared mine. Hello everyone, I hope you are well. Well, to put them in context, lately I've been playing Japanese or Korean language pokemon games, out of curiosity, in addition, to make a pokemon collection with these languages (Exepting events, and the 7 gene that I intend to do in Traditional Chinese). I hope to be able to share my collection in this beautiful community as a thank you for everything that has helped me, although I think I will delay a lot, but at least I think I can enjoy these games again. I'm going to be in Gen 3, with Pokemon Colosseum in Japanese, but I have a problem, I want to get Mareep, Togepi and Scizor from the e-card reader, I already have the e-reader in Japanese but I could not do The e-cards that I got functions and can get these pokemon, could you help me to make this request , I thank you heartily for your help. Hello RNG'ers! Today, I have prepared a save file for those looking to RNG Japanese Emerald's Mew for me. It is a copy of the HaxAras ticket save, but with both ID numbers changed to a special set that makes the only timid 6iv flawless method 1 spread shiny after 176+ million frames. (Refer to my earlier posts and threads for my desired hex PID of 7942EF72, with TID 60510, and 31337.) Anyways, this save file is ready to catch mew when using frameskip 9/10, turbo mode, 1000%, and vblank patching (all from reddit and bond697) to speed the game up to the only flawless frame at 176,000,000+ frames, which, instead of 817 hours or 5 weeks, would, after skipping frames this way, would only take 23-24 hours to hit the frame on a fast PC. This allows Mew to be obtained. If HaxAras's save is unwanted due to cheating, just use Glitzer popping on InsaneNutter's Used Emerald Cart save to change both ID numbers before getting Mew if you abhor cheats. You can trade the Mew to an English RS with Pandora's box TID/NAME/SID/Gender manipulation to trick the name rater into allowing a legit 10 letter english Name before pal-parking without save flashing. Before I forget, on VBA-rr, audio must be off, and the frame counter script for JP Emerald must run, while in addition, the GBA bios is needed for timing accuracy and legitimacy purposes. The desired frame to jump to is frame 176,562,489, which has this PID. You can refer to my first and second threads for the info on these facts, and you can get more info from HaxAras, Ammako, BlackNight(??? ), suloko, SciresM (possibly), the_Slayer, trigger_death (for GBA RNG info,), and my theories/observations in the connected posts. r/pokemonrng on reddit may help. My earlier wish for an RNG'd 3GPKM is renewed, due to the info found on reddit which, with the battle video method, significantly makes this more doable on console after using an emulator to store the frame counter in the battle video using that namesake glitch on reddit, which allows you to hit the frame on console after save flashing to a JP emerald. This allows shiny 6iv flawless "event ID" method 1 pokemon to be legitimately caught on console with assistance from a wii with fix94's save dumper tool. With school, I have little chance or explanation to waste 24 hours waiting for mew on rng, so I leave the process of procuring shiny event legends with longer names to those in need. Interestingly enough, the Hadou mew can be made using these 2 id numbers into a fan event, which is nicknamed to 10 letters, because the word "Hadou" is 5 characters or less in Romaji and Japanese. This means a hybrid JP event mew is makeable by RNG users due to GEN 3 oversights. Have fun RNGing! Hello I hope you are well. I put them in context; I am playing Pokemon Blue (JP) and Pokemon Crystal (JP), I was wondering if there is a save file editor for Gen 1 and 2 in Japanese, because I used OmniEdit, Rhydon Editor and Pikasav and they do not read these games and I want to have a backup of my two games. What do you recommend me to do? . Thank you very much for your attention. Hello Researchers! Today I have discovered an exploit for Generation 3 that affects Pokemon Legality for RNG. The exploit can be done in 2 ways. One way is to take a save file with Japanese/Localized dual compatible names and nicknames from a Japanese Gen 3 game, flash it to an English cart, and then take any already-nicknamed Pokemon (pre-naming fixes a bug with bank compatibility for Japanese-exclusive Pokemon like mew) to the name rater to enjoy longer English names when kept on that same file. The more legit way is to RNG both region games to have a 5 to 1 digit cross region OT, with the same SID and TID, similar to using RNG to rename event Pokemon via OT RNG manipulation. The next step to do is Nickname the Japanese Pokemon, trade it over, and rename it on the English game with the cross region characters. Accent letters for Latin and Japanese will pose problems, along with RS copies with the nickname flag bug. Anyhow, this process obviously fails when trying to make longer Japanese nicknames. This means Nicknamed 3rd gen event Pokemon, Nicknamed Shiny Jirachi, Nicknamed Celebi, and Nicknamed In game events are possible now to RNG users. Hopefully this helps Legality checkers! Thanks, and have fun! Hello again Trainers! I am confused on what type of request this falls under, and what thread, so I was hoping somebody could clarify. Anyhow, what I would like RNG'd and added to the Pokemon archive is a shiny, docile, 6iv flawless mew from faraway island. In this post I will include all of the numbers needed to reproduce it yourself on an emulated JP Emerald copy, frame by frame. I hope you have better luck at landing frames than I do. In that way, I guess I am like HaxAras. I have one final request for the held item. If it is not holding its default item, a Lum Berry, please give it one for authenticity of it being the most perfect Pokemon. Now, on to the Directions: Origin Game: Japanese Emerald OT Name: Iwata Species: 151: Mew Pokemon Seed: BF0B02AA PID: E85091A9 Initial Game Seed: 0 VBA-M-RR TID Generation Frame (plus BIOS intro): 4435 Clock Battery: Dead TID Seed: 835EFA48 (according to VBA-M-RR when using the RNG Script Suite for JP Emerald) RNG'able TID: 15575 Desired Compatible SID: 17710 Nature: Docile Caught location: 201: Faraway Island Met Level: 30 Level: 30: HP: 109: 31IV/0EV Attack: 74: 31IV/0EV Defense: 74: 31IV/0EV Special Attack: 74: 31IV/0EV Special Defense: 74: 31IV/0EV Speed: 74: 31IV/0EV Hidden Power Type: Dark Hidden Power Level: 70 Ability Slot: 1 Pokemon PID Generation Frame: 3886 Time: 1:04.76 Ball: Dive Ball Item: Lum Berry Enjoy the Mew, as I could not make it into a PKM without Kaphoptics' finest work, and please do send me the resulting PKM file. If you would, Please PokeBank it, and let me know how it reacts. I did not share the PKM file, as this is firstly the wrong thread, and possibly otherwise damaging to my reputation on the web. You are free to archive the Pokemon data files. For extra legitimacy (which I sort of half-care about), my challenge to you is to use suloku's tool, in dol format, without a permanently traceable modded console, (such as using please.hackmii.com or Wilbrand directly with the Gen III wonder card tool, on a virgin Wii if possible, otherwise, if taking on the challenge with a virgin Wii is too costly, just do the above on your hacked Wii without using bootmii or the HBC (it will be untraceable in the PKM. I prefer using PokeLoad on gc forever if you care about legitimacy. To flash the memcard for use with PokeLoad using gcmm without the HBC or Bootmii, just use Smash Stack with gcmm instead of hackmii, and then load the memcard up with your favorite working gc Pokemon game, and use the tool for max legitimacy. All RNG must be done in VBA-M-RR, so Fix94's link cable dumper must be loaded the same way for the highest legitimacy. For the most legitimacy, use the SD reader bundled with JP channel. Feasibly this complex setup simulates corrupted memory cards, and could very remotely happen if a wish maker Jirachi was caught at it's best shiny spread first time, first try. Is there a save editor for Japanese Red/Blue/Green/Yellow? Warning: Please do not get scammed on Wi-fi trades. Anyone who offers you an "egg" of Volcanion, Hoopa, or any hacked Pokemon claiming they can be traded is lying to you. Deeply apologize if this is the wrong place for this, so mods feel free to do what is appropriate. I thought I'd post this in R&D because I have done a bit of research into these two topics and it appears to be of particular interest to many people who have questions about getting a Japanese 3DS and whether a Volcanion, Hoopa, or other hacked pokemon can be obtained by hacking the Pokemon as an egg (as a way to bypass the legality checkers on Wi-fi services). I also feel this has been asked MANY times in other threads and will continue to be asked by newcomers. Here are some clarifications regarding what you can or can't do with a Japanese 3DS and/or using Pokebank if you have the Cyber Save Editor 3DS by Cyber Gadget, and some myth-busting regarding trading hacked eggs: You will need a Japanese 3DS if you: 1. Bought a new Japanese X/Y game so you can initiate gameplay of the game and advance until you get the pokedex (or whatever the checkpoint is to enable use with Cyber Save Editor 2. Would like to trade eggs (for some reason) from your Japanese game to your non-Japanese game (Pokebank will not store eggs) 3. Want to have Latiosite, Latiasite, Soul Dew, Sacred Ash, or any of the other unreleased items (Pokebank does not allow storage of items, held items will be sent to your bag if you try to store them in Pokebank). These items can be traded to your non-Japanese game via local trade. That's about everything I can think of right now. 4. Don't care for trading permanent Mega Pokemon to your non-Japanese game, as this cannot be done via local trade. You can use Pokebank on your non-Japanese 3DS if you: 1. Have a used copy of a Japanese Pokemon X or Y cartridge that has been sufficiently advanced to enable Cyber injecting. 2. Want to transfer permanent Mega Pokemon to your non-Japanese game, as this is cannot be done via local trade. 3. Don't care about obtaining unreleased items on your non-Japanese 3DS. OR you don't care about having hacked eggs (which cannot be traded via wi-fi, more on this next). Now to bust the hacked egg trading myth: <- For anyone that really doesn't believe me when I say it doesn't work, here is proof of it, because a lot of people that come up to me about it want to know for sure (not sure if any of them read this forum).Furthermore, I think hacked eggs can in fact be sent to Wondertrade. However, I have heard that the receiving end of any hacked eggs will get a bad egg that will never hatch. I'm not sure whether this can be confirmed, but my suspicion is that wonder trading hacked pokemon was the cause of all those bad eggs floating around wonder trade last year. I really hope this helps. Thanks for readying. Basically whenever I sav a pokemon for HG it alway gets boosted exp despite having same ID, secret ID etc. I believe this is to do with the size of writing. 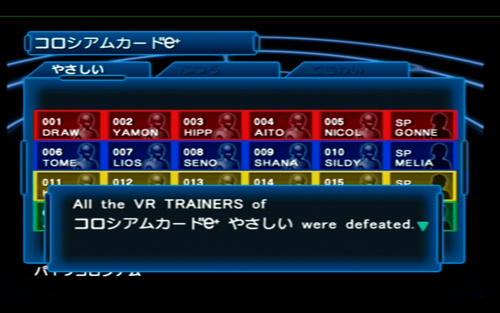 When you enter your OT in pokesav it appears in game same size as English version writing. However the English version writing is smaller than the English text used in Japanese games causing this problem as the Japanese games use a larger font size. You'll notice this if you flick between an in-game caught pokemon and a pokesav generated one. Does anyone know how to get the Japanese sized English language generated by Pokesav? Many Thanks. Basically the keyboard when making name is split in 4 tabs; 1st is hiragana, 2nd is katakana, 3rd is latin and 4th is numbers, symbols, e.g. You can't just edit your name from one latin based name to another (our alphabet) by just using pokesav for HG/SS because it will use the english way of saving a name, using the first table and not the 3rd. I know the hex code for the name I got and for the name I want, but editing directly in the SAV using hex editor makes the save corrupt and unplayable... Is there any way to hex edit the name but not make it corrupt? Perhaps some other tool I don't know about? If you have a suggestion/correction/update for any of the translation files, please post here. Since all of the translations are present with the release of beta 25, it'd be preferable to only post corrections to individual lines, rather than uploading a whole file. There are untranslated lines in just about every language at the moment, so updates are appreciated. Note: Translations are not done by me, therefore I can't guarantee their accuracy. I am looking for an action replay code that allows me to rename Pokemon that I received in a trade to be nicknamed in Japanese. I would like it to work when I go to the name rater to change my Pokemon's name. I would appreciate that very much. How to use Japanese text in Pokesav! Since A LOT of people have trouble with this, I will redo everything that needs to be done so Japanese characters can be used on your computer. Here we go. Windows XP First, you'll need to make sure you acquired the Windows install CD (how, I do not care). Next you must go to Start > Control Panel > Regional and Language Options. Click on the Languages tab of the window and check off the "Install files for East Asian languages" and hit apply. After you have installed the languages and restarted your computer you'll want to download the AppLocale installer and install it. Now that you have everything all set, gather your Japanese and get ready. Start up AppLocale, find your copy of Pokesav, and set the language to this: Now just find the spot that you need to put your Japanese in, and paste. If you have any questions/problems, just post them here. PLEASE DO NOT MAKE UNNECESSARY TOPICS! Windows Vista In Windows Vista, using Japanese text in Pokesav is even easier. All you need to do is set your regional Unicode settings to Japanese. To do this, follow these steps, accepting UAC prompts as necessary: Go to the Control Panel (Start > Control Panel). Select the Change keyboards or other input methods link under Clock, Language, and Region. At the top, select the Administrative tab. Click the Change System Locale... button. Change the drop down list to Japanese (Japan) and confirm. Windows will then prompt you to restart your computer. After you're done using Japanese characters with Pokesav, change this setting back to what it was before, as it could affect some settings on your computer. Enjoy. I have small question and a request. My question is, When making a PKMN in Pokesav, in the party edit screen, does setting it to JPN translate your trainer name for you? If it doesn't then could some one post the name George, written in katakana (the writing style they use for the game), in a text format I can copy and paste it into Pokesav? Thank you. adamant natured moves: ice punch, hydro pump, dragon dance, aqua tail if you have one, pm me. thank you in advance. I would like a Mew with it's name in Japanese please. OT: Kaelan ID: 54028 Moves: Nasty Plot, Dark Pulse, Ice Beam, Aura Sphere Ability: Synchronize Item: Leftovers Ribbons: none Contest Condition: none IVs: All 31 EVs: All 255 Ball Caught: Masterball Date Met: 2009yr 4mo 15day Place Met: GTS PP UPs: Max PP UPs Happiness: Max Happiness I want it to take slot 1 IN PARTY Shiny: No Nature: Modest Want it in a Action replay code please I want it for Pokemon Platinum please.